If you are looking for a remote working business plan, a business plan that allows you to work from wherever and whenever, then I may be able to help. I take that back, I most certainly will be able to help. Back in the year 2000, I read a book called The 4-Hour Work week. Now I haven't read it in a while and I definitely can't quote it word for word. But I remember a feeling that I got from that book that taught me one thing; Depending on how, when and where you make your money, will determine the lifestyle you live. This saying has stuck with me since then and I have focused my life's agenda to being able to make money from absolutely anywhere. And I mean anywhere. In the middle of the woods, where I happen to be currently sitting by a campfire writing this, on the beach, in a major city, on a cruise ship, on an airplane, anywhere!! Fast forward to 2018, when I am writing this, I currently received money from a client this morning while I am camping on my own land in Upstate New York. I spent the earlier part of the morning at a local McDonald's using the Wi-Fi to finish client work and spent the afternoon working on a cabin in the middle of the Woods, while taking client conference calls. Most days I wake up and work in my sweats, might as well be my pajamas, because no one ever sees me and I can work from home. In fact, I commonly go to the local cafe just to get out of my house. I also take trips to distant locations just to be able to work from inspiring places, or places I have always wanted to travel to. If you are looking to build a remote lifestyle, I can help. I don't know all the secrets, and I won't promise that I can make you a billionaire, but I can tell you how to live a pretty awesome life, making money from anywhere. Here is some useful advice for those people out there who would like to work remotely. Blogging. Blogging about certain topics where I can provide services has really been a solid stream of income for me remotely. 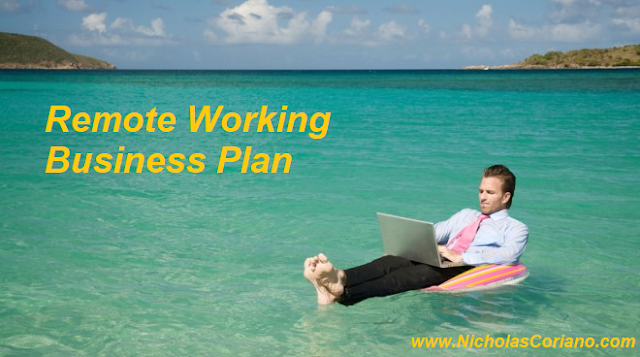 I commonly blog about business plan writing, entrepreneurship, and a host of other subjects. After blogging so much, you have enough content to create ebooks and tutorials but more importantly, people find you on the web. And you start becoming an authority in your field. And then you can start charging for something. The truth is you can start charging right away, but the more you blog, the more traffic you will get and thus the more customers will come. If you check out my website NicholasCoriano.com, it started as a Blog. I blogged about business plan writing and my services in Connecticut and before I knew it, I was coming up on page 1 of Google for "business plan writing in Connecticut". I kept blogging about business plan writing. Business plan writing services that I offered in Massachusetts and New York. I wrote a blog post about construction business plans and restaurant business plans. And before you know it, I was showing up on the first page of Google for "business plan writer in Massachusetts". If you don't have any money, start a blog, focus on 3-4 keywords in a row, like Connecticut business plan writer, and write a ton of articles about it. Currently, today, right now, this will bring you up on page rankings and will create a decent revenue stream. E-commerce. Buying and selling things online. EBay, Etsy, Amazon, and even now Walmart allow you to sell on their platforms online. Find something to sell. Go to yard sales and pick items and resell them for more on these platforms. Find items from China that you can buy and sell on other platforms. Or better yet just put up pictures on these websites of items you know you can find somewhere else and when they sell go order them from that person and ship them to your customer. This is also called Drop Shipping. I can go on and on about how awesome eCommerce is but you know people are making hundreds of thousands of dollars on these platforms online and even millions of dollars from their basement or part-time. This is a growing sector and allows you to not have to be anywhere to do it, especially with the dropshipping model. Dropshipping is basically when you list an item for sale that your supplier has and will ship to your customer when sold. If you can find a supplier of a product that is not currently online, bingo bango, you got a Monopoly online. This is a underutilized tactic in the e-commerce arena. Because of the proliferation of drop-shipping and many online courses, dropshipping sites have become popular and oversaturated. When you find a product that no one else has online and bring it to the online world, you create a monopoly. Monopolies is a good thing. Ebooks. Again I'm only going to speak on things that I have experienced. Things I have made me money and have allowed me to write this blog post while I stare at the beautiful fire during my camping trip. After blogging so much I realize I had a bunch of articles that I could put into a book. So I collected all of my blog posts and copy and pasted them into a Word document. It took me about 48 hours hours to organize them, edit and revise then. I handed them off to a few professional colleagues to read over once and I published it on Amazon. My first book; Rules for Entrepreneurship. That's half the battle. The other half the battle is actually selling the book. Constant promotion on social media and building content that leads to an engaged audience is necessary for any type of sales online. Unless we are talking about PPC, we'll get to that. But basically promoting my ebook whenever I can on social media or on my website or even in conversation helps makes sales. The small sales add up. And the best thing about it is that you have to do absolutely nothing when it sells. The money gets deposited into your account, the customer gets the book, and you do nothing. Your work is done after you published a book. Sort of, remember you have to market the book. Tell the world. Pay-per-click ads. As I've written about before, I truly believe entrepreneurs should exhaust all of their free marketing strategies before they move on to strategies that cost them money. But when you have the budget, or you understand that the ROI is effective, pay-per-click ads online can significantly boost your Revenue. First things first, you're going to need a product or service to sell. Once you understand what you're selling, running ads on Google AdWords, Yahoo, Bing and even Facebook, can be extremely lucrative. Because these ads allow for extensive targeting, they can attract customers that are ready to buy or customers whom fit the target demographic of someone who would buy your product or service. Like any marketing strategy, you need to test this to understand it. But once you understand it, directing traffic via pay-per-click ads to your website or your online store or even to your phone or email can be a lucrative way to make money from anywhere.